It's a mobile game developed by a company called Gung-Ho. It's a match three game not unlike bejeweled however you have a team of six monsters like pokemon, and you can move the orb around the grid, not just move it one space. It is one of the most popular mobile games in Japan right now, and in the US market alone, PAD makes $11.89 per player, while second on the list Big Fish Casino makes $2.07. This is coming from an industry were 50 cents a player is like good. Anyway it's super popular in Japan coming up with like 32 million downloads, and has a spinoff game, a spinoff manga, an arcade game and was referenced in some animes last season. Why Should You Play PAD? Like looking at the game there is like no reason that comes to mind why you want to play this. There's no pvp, no story, no real progression other than harder dungeons. When asked most people say mechanics but like even that's not a really good reason to play. I guess it's kinda like you play to see what it's like and then you get wrapped up and then you build an emotional connection to your monsters, and then you keep playing. So when you start the game for the first time you do 5 tutorial dungeons and these give you 5 magic stones with which you can use to pull the Rare Egg Machine. This is your starting roll. It is said that starting roll is really important, that you want to roll the best monster you can, preferably a God and a good God at that because it makes the game easier. Because of that if you don't get a good god, you delete the game and do the 5 dungeons again and roll until you get the thing you want. Now the theory behind this is that you're basically getting that roll free, and it's something you can do over and over again until you get something good, basically the best possible start that you can get. Personally I rerolled because my friend got me into this and he told me to so I did. However, I don't know how much it changes how easy the game is. However I do know there are a lot of people who are put off having to reroll like my friend's girlfriend and just decided it was too much of a hassle and decided not to play at all. Reroll if you care, don't if you don't. If you're not spending money on In App Purchases then only roll during Godfest. They're twice a month, one around the middle, one around the end, usually starting on a saturday going through the weekend. These are 3x drops on specific series of Gods in the REM. Also it's okay to roll for Collabs if you think it's worth it. Also try not use stones for stamina refills or retries. Only increase your friend list if you're desperate, but it's completely fine and recommended to increase the capacity of your monster box. Anyway that's my intro to PAD, everything else now will be about the monsters. There are 1,877 monsters in Japan as of today. I basically put the numbers in a random number generator and that gives me a number, and I shall talk about that monster. I'll probably do 3 a post. And if there's evolutions I'll talk about the series as a whole. The numbers I picked out will be in the post name. So she is part of the Sticker Girls series that you can only get through the Pink Egg Machine that comes up sometimes. So kind of a Collab monster but not really. 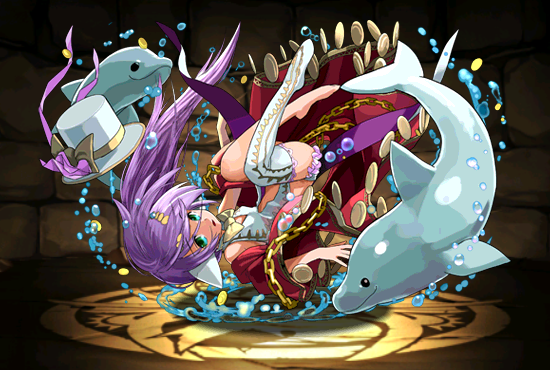 In the beginning the Stickers girls were seen as trophy waifu drops, and the real reason to roll the Pink Egg Machine was for Valkyries and 4x for some female God types. Then Bikinitron came and the sticker girls got ults and they started getting more feasible. Then they got skillup with the new Angry Birds RPG Collab and now they're actually really good. 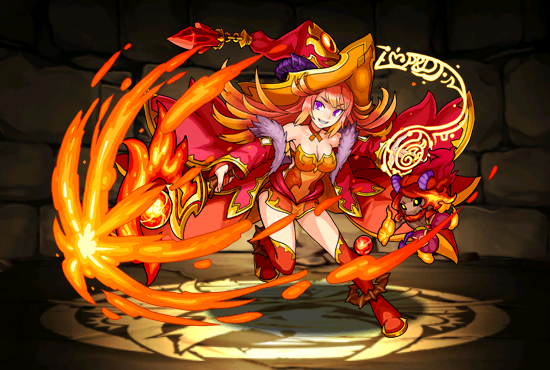 So Ruka's skill is a Double Guard Stance, which means 2 elements get changed to Heal Orbs, so for her it's fire and dark which is good on a water healer team because they're mostly light and blue and don't really need fire or dark. At max skill it is 9 turns which is pretty good but Siren's is faster at 5 turns max. It depends whether you think the dark conversion is worth it. Her typing is Healer/Attacker, like all Sticker Girls but there isn't much use for the Attacker subtype in regards to water, so she goes on a Healer team or Andromeda team. And the real reason why people loved her after she got her ultimate form is because of the new awakenings. It used to be other than Odin the only 1000 auto-heal people were Archangel and Alraune, but now all the Sticker Girls get it. The anti-skill bind is useful and the extra row enchance helps with damage. There's a lot of debate between using her and Gabriel. So Clash of Clans Collab. Two of the biggest mobile games getting together. 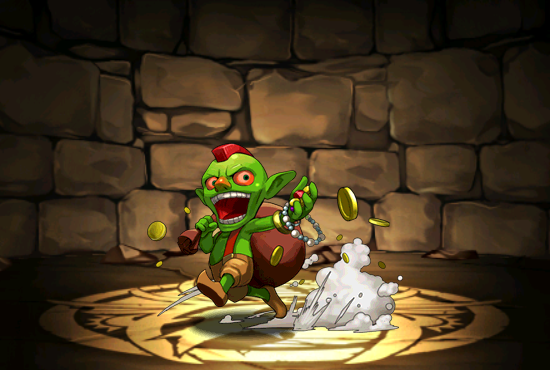 This is one of the monsters that you could have gotten in that dungeon. To be honest it's crap. It's only used to skill up Freyja, or as a farmable Freyja substitute. There's no real reason to use this. It has a horrible leader skill. Maybe in a low cost dungeon if you're running a mono green but there's a lot of other options out there. Skill ups are still useful though. A relatively new monster and REM only. Part of the Wizard Series that focuses on two-prongs and row enhances. She is actually pretty good but will probably get less and less used as the game goes along. So the reason why she's good now, disregarding her skill is that she's an Attacker/Healer type that's red. Red doesn't have many healers and is also lacking on the RCV side of things. So if you need a RCV stick she's good. Furthermore she's an attacker as well and Red is mostly attacks. Flamie with his 3x attacker is also red, so you have some great synergy there. Her skill converts the top row into red which is going to be used by monsters with a lot of row enhances, Rodin, Cao Cao, Ares, all of which are attackers. Her two prong doesn't have much use though and her anti-skill bind is okay. Her leader skill is something most Wizards share, if you use a skill on that turn attack for all monsters on your team is 3x which is really just a nerfed Valkitty but you can't get Valkitty unless it's Hello Kitty Collab so these are the next best thing. So this is my friends reasoning why this leader skill is actually pretty good. There's a monster called Super Gunma which is part of the Gunma Collab however it's farmable during that time. It's skill is bad, however if max skilled you can use it every turn. So if you have that and a Wizard as a lead you can have a constant 3x which is pretty meh considering leader skills these days, but supposedly the big thing is that you can choose when you don't have 3x, allowing you to stall for skills because a big problem with burst teams is that they can't get their skills up in time. Questions, comments, IDs, Feedback in comments please. I really like your feedback.